Roz-Maria Park : The borough council obtained the convent of barefoot Carmelite monks on the 21st of August 1978. The lower part we find a public garden which contains beautiful collection of fountains and a fishpond from 18th century, both historical monuments. 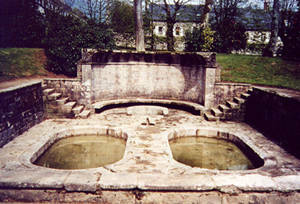 The two oval basins are dominated by a semi-circular edifice which served for meditation and shelter. The big basin was a fishpond, the monks subsisted thanks to fish. The main half moon shaped pond was also as a more accessible fishpond and also for washing feet, because the monks only wore leather sandals. The town having found the original archives and now trying to restore the garden to its original state. And so an apple orchard is being created in the south east of the park. Every day. Guided tours by tourism office by appointment.